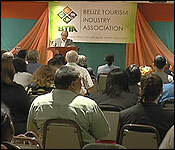 The Belize Tourism Industry Association is made up of those business owners, tour operators, and stakeholders who depend on the Tourism industry to make a living. This industry is the biggest FOREIGN EXCHANGE earner for the country, and so, those who work in this sector are doing their part to make sure it continues to thrive. "We're having our 32nd Annual General Meeting today, where we report back to the membership in terms of the achievement over the past year. Our industry, as he heard from Dr. Martel from the IDB in his presentation, is they major industry for the country. We heard our Prime Minister, a couple weeks ago, refer to the importance of our industry, to keep our country afloat in the midst of the financial crisis that we face and these major debt obligations. So, the country depends on the industry. 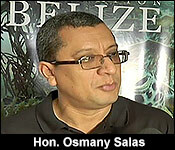 So, we need to ensure that we continue develop, a unique Belize tourism project. We shouldn't be copying anyone. We should be borrowing, adapting good lessons, but we should continue working at developing our unique product, and we have challenges. We have to be careful not to over price our product. We need to ensure that we remain competitive. And hence, why advocacy remains and important role of the BTIA. We represent the tourism private sector. We have other associations represented that have a seat on our board, the Belize Hotel Association, the Association of Cruise Harvest Providers, tour operators, tour guide. So, we are the tourism umbrella tourism private sector association and we have destination chapter boards country wide, 10 in fact. It is the tourism private sector that has the pace. Our tourism private sector are the ones who are developing our product, and the bulk of our membership come from the over-night sectors, the tour guides, the tour operators, the ones that depend on the visitor that comes here to stay for an extended stay, for multiple days. Those are the ones. Those are the visitors that will spend. Those are the ones that will ensure that the industry has a positive impact on the economy, and these are the same stakeholders, industry stakeholders that are always concerned about ensuring that we don't overprice our product." "I actually had 1 more year under my second term as president. But, I decided, after consultation with our board, that I would not complete my final year. I need to put more focus on my senator duties, and the work that I do with the community in the Senate, which is represented by the Belize Network of NGO's. So, it's a big workload ahead and I'm all up for it, and I wanted to give it most of my attention possible. So, I felt that I would pass the mantle at BTIA to our first vice-president, Mr. Reineldo Guerrero, who graciously accepted, and will complete my term as president at BTIA." "So that's how the succession works?" "Well no, you usually complete your term, and then, we have elections, but our articles of the association allow that in the event of a vacancy mid-term, the board does have the authority to appoint one of its members to fill and complete that post. So, in our case, we asked our First Vice President to step up, and serve as president for that final year. We have elections for a first vice president, a secretary, and the treasurer. Those are the tree posts that are up today." At this general meeting, the BTIA elected a new Senior Vice President, a Treasurer and Secretary.